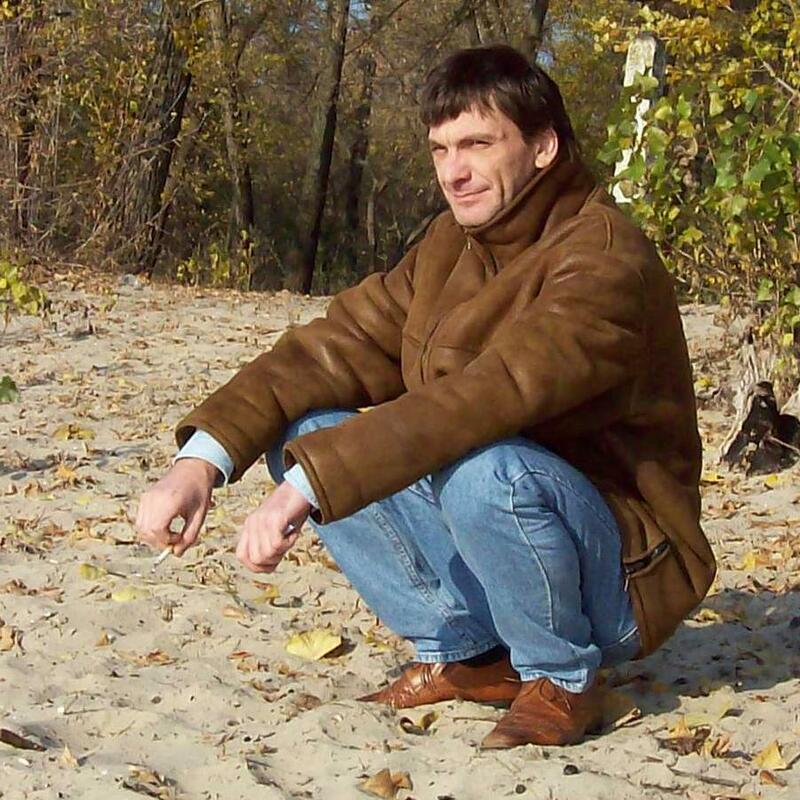 I'm Serhiy Shamshetdinov, software and MC systems (in the past) developer from Kiev, Ukraine. I'm 44. I'm looking for fulltime Junior/Middle Scala Developer position in Kyiv or fulltime remote job. I'm relatively new to this wonderful language and OOP, but have many year's experience and power of stable and useful systems design. I'm intuitive person and want to gain my Scala experience on real project developing. My feeling is: "By code semantic Scala relates to Java like plane C to macro assembler". My way in programming (since 1984) was: assemblers, plane C, VB+.NET, TCL, minor Java, [HTML/CSS], JS. I see my future mostly with Scala. I may start my work with refactoring, bugfixing, coding servlets/scriptlets, coding services/sever side based on ready code or ready/Googled/Doc templates and writing tests. Scala/Java/JS experience is currently described in my English CV. The Download section of this site contains some samples of my past projects. Please, don't hesitate to contact me via e-mail serhiy@sands.net.ua if you need more details or if you have questions and/or suggestions. English version of CV is Serhiy Shamshetdinov, developer CV, Eng.doc - most up to date. Table of developed projects Serhiy Shamshetdinov, projects, Eng.xls. Russian version of CV is Serhiy Shamshetdinov, developer CV, Rus.doc - infrequently updated. PHP session save handler and back-end Java part for caching at multi-node back-end with EhCache. PHP session’s data is transferred over HTML or JsonRPC. Building Excel charts on calls statistic to see maximum lines load and its duration during every day. The aim was to minimize number of external phone lines (analyzing daily peak load). Download it in middle state RoTris.apk. Points are not counted. Speed is fixed. Size depends only on screen size. Options are only decorated but show final idea. It is my first Android project. Training game: random floating random Ukrainian letters, tapping pronounces its sound, kid asked to tap the right one. Download ABCRescue.apk and give it to your child to try. Idea is not finished. dev. OS: Windows 7; languages: Java SE 6, XML; tools: Eclipse, Tomcat, log4j, SVN, CVS, Bugzila, Junit, etc. 10 years in production products: IPS (WEB, Struts/GWT based, JSP) and CPM (Swing) for monitoring/controlling DOCSIS cable networks. Learning Java, bugs fixing, corrections, refactoring and minor enhancements (projects contain about 10000 files totally). It is my first Java project. One Distributor controls any number of remote Executors to fulfill the CLI/SNMP task list (each task with specified interval continuously or fixed number of times). Distributor implements load balancing of Executors using task’s weight and Executor’s load limit. Distributor logs results of all executed tasks. Distributor and Executors are auto connectible. Simple GUI application for files encoding/decoding with free key file. Asked by my university teacher to test his encoding algorithm. - VB 2005 active object for WEB page embedding which plays video stream and makes possible saving it to local hard drive (building Direct Show Filter Graph). 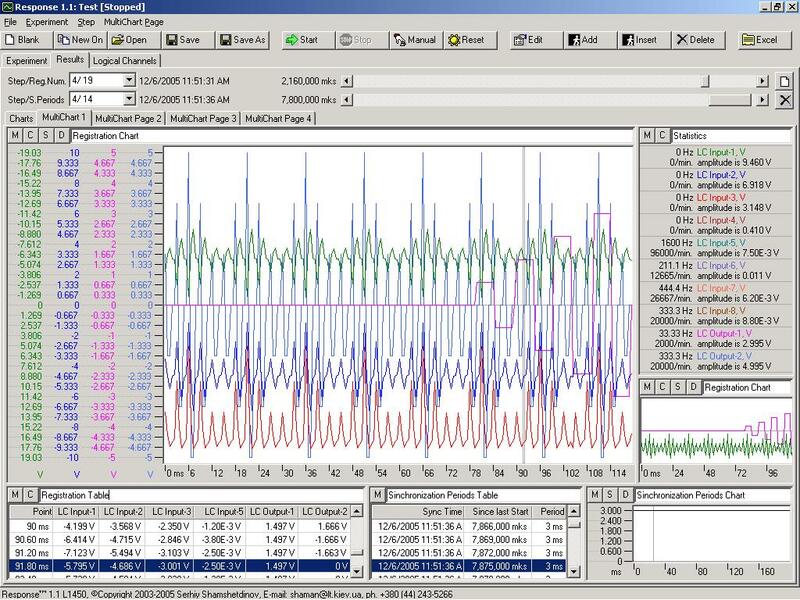 This is the PC software that helps to execute experiments which are controlled by PC DAQ board. User may define experiment as the set of steps each with different DAQ input/output channels modes and condition of step finish. For user suitability any channel may be defined in user units and scale. Each channel has zero and scale calibrations. Step of the experiment defines common input channels registration parameters (sampling period, repeating period, number of registrations or step duration), different types of output pulsing and optional synchronization modes. Download Response 1.1 Setup. You must have MS .NET 1.1 SP1 installed to run Response 1.1. Package also installs this Russian Response 1.1 User Guide. This Response 1.1 Experiment File Sample may be opened withing Response 1.1. 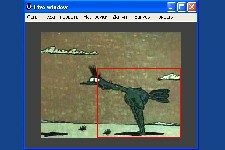 Adjustable motion detector of the video source. My original algorithm of motion detection uses level sensing of square and/or size of brightness and/or edge changes in selectable region. It shows windows with intermediate results (brightness difference, edges, edge changes) and sensors activity diagrams. Optional sound signaling and video activity fragment saving are provided. Sumix developed SMX-110 USB camera was inspected and tested for picture noise. Picture noise testing application was written using ready API. Power modes, PCB design and camera construction were corrected to achieve as minimal noise as supplied CMOS sensor avails. VB 6.0 OCX component and test application were developed to interact with сontroller of Interferometer. External MC based adapter detects on-hook line state, digitizes phone line signals and sends mixed stream of all active channels to PC via LPT port. 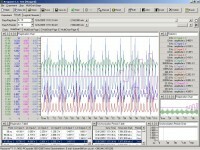 DOS software splits the stream and stores phone call data to separate WAV files for each active channel. Access to stored data was made over network. Fast algorithm for rough 3D image preview is developed with building graph within MS Excel. The input is the sequence (z) of interferometric pictures (x,y) got from interferometer’s camera . For each point (X,Y) of image its brightness produces sinusoid in z dimension. The aim of this algorithm is to detect quickly phase of sinusoids for each (x,y) point. WSE consists of flexible set of parameterized TCL scripts, Shopping cart (PERL) and Admin part for building Oracle based WEB Store with credit card payment. My part was writing TCL scripts for DB data representing in HTML and Admin part for the store controlling and DB filling. Simple “CDPlant” based multi-user database for goods registration, goods movement and using tracking, planning and creating orders to manufacturers of goods based on current and minimal amount in the store. Simple system for forming graphical bills and sending ones via E-Mail. Bill data was stored in MS Excel Sheet. The goal of the project is PC to Office Phone Mini-station connecting, storing calls history, importing, sorting and filtering information about phone calls with MS Excel. Mini-station was connected to PC over COM-port. Resident program logs data to temporary file. Excel macros adds new calls to history. “CDPlant” based DBMS for goods tracking. Multiuser System monitors CD manufacturing orders fulfillment. 12 possible parts of manufacturing process execution, in/out of stock. Second implemented version was able to calculate timing of orders at the moment of ordering. Different reports preparing using MS Word templates with special tags. Finally source code was 50 000 lines of VB. “Orders” DB table had 160 fields. Custom part of process interface customization was possible (manager, reception, designers, manufacturing, printing, packing, stocking, etc.) with different rights of access. DB had user friendly backup/restore procedures. Custom record locking mechanism was made. Parametrized search, administrator controlled configurable tables. It was my first project which used Visual Basic and SQL. Aim of our project was to make parameterized selections from ready team scheduler DB and to print results in different formats. Command line input, calculating and printing results of team tests. Algorithms of calculations were given by customer. Developed board grabs composite video signal with 12MHz/8bits sampling. Data was written directly to PC RAM using Master mode of ISA bus. Board had about 40 logic DIPs and fast ADC. Grabbed composite PAL signal data is decoded by software decoder to get color picture. Original task at blast furnace is the optimal control of gas flow. The key problem is that measured data for determining optimum gas flow is changed very slow and these changes are within measurement error. So this situation produces unstable systems of linear equations to get gas flow control. Used algorithm is the part of A.N.Tikhonov’s work on regularization of ill-posed problems. This program solves system of linear equations (20 variables, 3000 equations) with solution error about 10-20% while the same system solved by least-squares method gives error about 3000% (3 thousands %) – tested on model. Proofing of formula style theorems and printing the path of it’s proofing or mismatched axiom. Tetris classic in text screen mode for i8080 based computer. Its design was improved and Tetris was implemented by my officer at his home computer. Packing structure and idea was thought out by me. It was just Huffman method packing . But Huffman had better algorithm for building recoding table that is why it was used. TED like screen text editor. It was like today’s TextBox component with multi-line capability and file operations. Game for teaching keyboard typing in text screen mode. Words were rockets lunched from 1 side of the screen. You had to type this word quickly and then this rocket was destroyed by anti-missile defense. Otherwise word-rocket destroys something. The idea was brought by my teacher. Tetris like game in text screen mode. It has selectable brick size (3-5 points) and glass width (4-20). Tetris classic in text screen mode. Tetris is not my idea. I’ve made it twice faster and having selectable glass width (4-20). Tic-Tak-Toe that was accumulating playing history and improving it’s playing quality (counting symmetry of field). Program that executes Turing machine’s programs. Several programs of Turing machine was realized for execution (hh:mm Digital Clock – about 25 instructions of Turing machine). It was my first written and implemented program. Driver of 10 digits indicator with animated shifting (new number appears from left/right and top/bottom with shifting).